Upgrading to a new Delta<sup></sup> showerhead is a great weekend DIY project. No special tools required. Prepare yourself for the feeling of more water with H2Okinetic Technology.. H2Okinetic. provides a truly better shower experience. The warm, drenching water coverage is the result of a denser water pattern and larger droplets that retain their heat longer to soothe and revitalize. Upgrading to a new Delta. shower head is a great weekend DIY project. No special tools required. Innovative Pause feature allows you to conserve water while lathering up. Experience a better shower with the control and flexibility of a Delta hand shower. Great for showering yourself or your loved ones and pets, as well as for keeping your shower and tub clean. While other products may gather unsightly mineral build-up over time, Delta soft rubber Touch-Clean spray holes allow any mineral residue to simply be wiped away for an instantly refreshed look with no need for soaking or the aid of chemical cleaners. Prepare yourself for the feeling of more water with H2Okinetic Technology.. H2Okinetic. provides a truly better shower experience. The warm, drenching water coverage is the result of a denser water pattern and larger droplets that retain their heat longer to soothe and revitalize. Upgrading to a new Delta. shower head is a great weekend DIY project. No special tools required. Raincan Single-Setting Shower Head, Chrome Upgrading to a new Delta<sup></sup> showerhead is a great weekend DIY project. No special tools required. 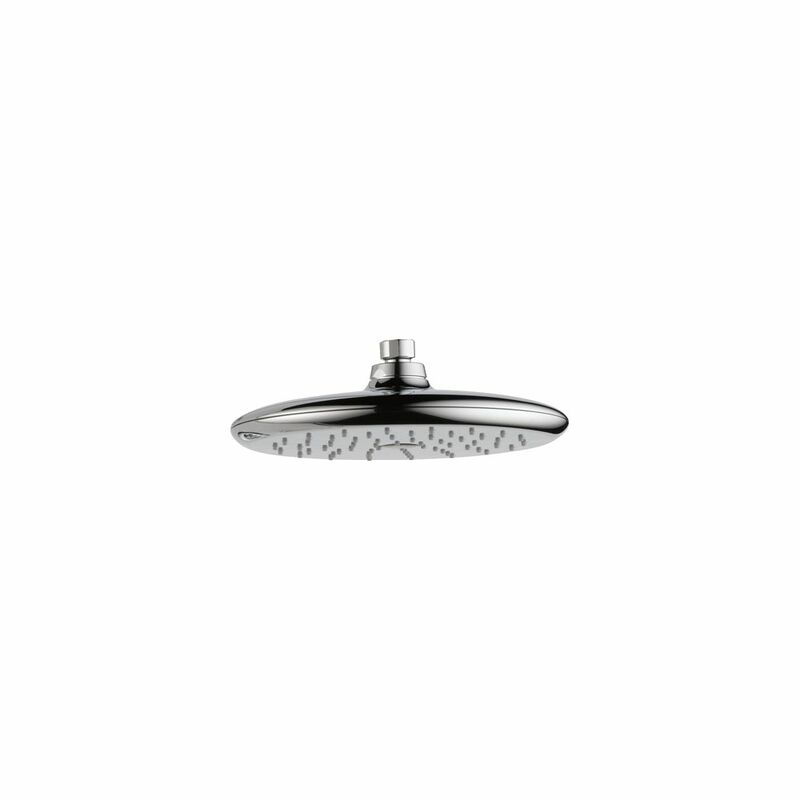 Raincan Single-Setting Shower Head, Chrome is rated 4.0 out of 5 by 7. Rated 5 out of 5 by Sagstetter from Works great; installed easily without leaks. Didn't have to wrap... Works great; installed easily without leaks. Didn't have to wrap threads of pipe with new piece of teflon tape. Unscewed old shower head. Screwed new one one hand tight.Also, shower water pipe would "sing" when turned on with older shower head. The "singing" seems to have been eliminated upon installation of Delta Rizu. Rated 1 out of 5 by Tim from Loved the shower head after install was exactly the rain shower i was looking for. Six months aft... Loved the shower head after install was exactly the rain shower i was looking for. Six months after install it began to leak badly at the seams. Even flooded my bathroom before I could get it shut off. This after six months at a residence we only use art time. Very disappointing for a Delta product. Rated 5 out of 5 by Carissa from Super good shower head and stream. Nice and big, and... Super good shower head and stream. Nice and big, and firm stream. Rated 2 out of 5 by Rainman from This shower head was exactly what we wanted...a rain type head in gold to match our other fixture... This shower head was exactly what we wanted...a rain type head in gold to match our other fixtures. It worked great .....for about a year. Then the 2 parts of the head started separating. The bottom didn't completely break off from the top but water does spray out to the side at times. See the picture below. I would think for $116 it should last more than a year. We now have to get a replacement but will not get this one again. The only reason for 2 stars vs1 is we did get 1 year use out of it. Rated 5 out of 5 by Anonymous from great deal Good shower head . Had to remove flow restrictor with hammer and screw driver but then perfect. Rated 5 out of 5 by Bonnie from Great shower head Easy to install, perfect spray. I use this showerhead in a walk in shower and the spray is not wide enough to spray out onto floor, but dense enough to be an overall great shower experience. Definitely recommend this in all aspects!